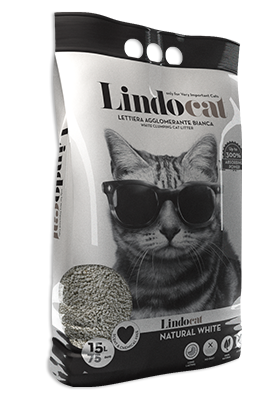 Lindocat Natural White is a first class performance clumping cat litter. Made of 100% premium pure white bentonite, it has excellent clumping, absorption and odour retention properties. The white colour of the litter granules makes it easy to keep an eye on the cat’s health as changes in the colour of the urine can be detected immediately. Its fragrance-free formula makes Lindocat Natural White the ideal litter for cats with a particularly sensitive sense of smell. Bentonite (the name comes after Fort Benton, Montana, USA) is a clay derived from hydrothermal alteration of volcanic ashes. Bentonites can be found of various colours: white, grey, pink, brown and red. This versatile material is known since ancient times and used nowadays for many different applications including cosmetics, clarification of wines and fruit juices, and also pharmaceutical products. 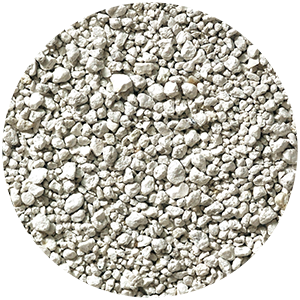 Coming to cat litters, this special white bentonite is used for its pleasant appearance and for its exceptional capability to absorb liquids up to three times its own weight. Liquids and odours are restrained in clumps easy to remove leaving the remaining product intact for further use. For its special characteristics in terms of visual aspect and quality of performances the white cat litter is widely recognised as one of the most precious. Long-lasting: a top performance litter: 15 litres last 75 days. No dust: low-dust content formula, does not track. 100% natural: made of naturally absorbent mineral clay. Clumping: fast, high performance clumping.